The most explicit symbol of growth, seasonal death and revival is a tree, which has always meant more than a part of a landscape. Since early times it has become part and parcel of folklore and nowadays a tree for some ethnic groups is a totem, a mystical remote ancestor of a tribe. Sacred trees had a magic power innate in their nature. 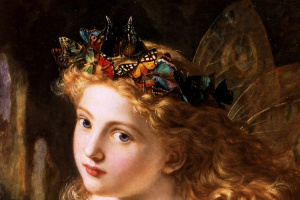 One could assume that some of this magic is inherited by the paintings depicting trees. Different trees symbolize different qualities highlighting a general sense of a painting. The structure of a tree embodies early views of the universe arrangement: roots were considered like the underworld, a trunk was considered as the earth and a crown of a tree was associated with the sky. A lot of the folklore characters reached the sky climbing up the limbs of trees. 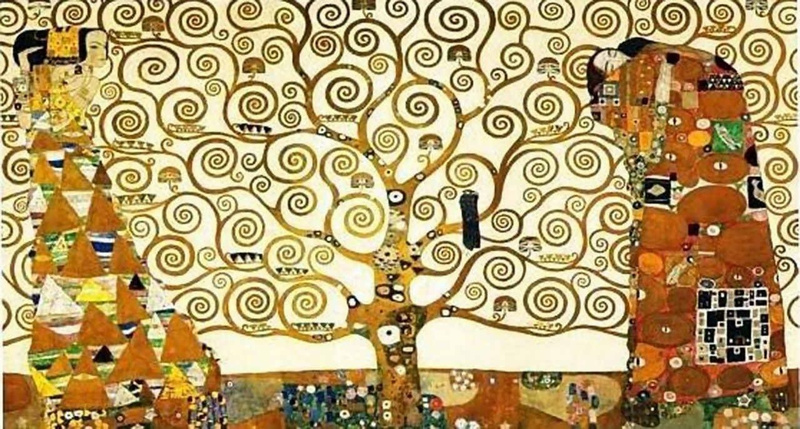 That is the reason why a tree has become a popular symbol — the Tree of Life — and integrated into the fine art culture being the ground for traditional ornamental patterns for the most of ethnic groups. 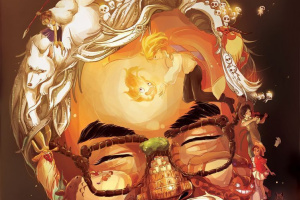 The humanity reaches spiritual enlightenment and salvation making it to the top f the Tree of Life. 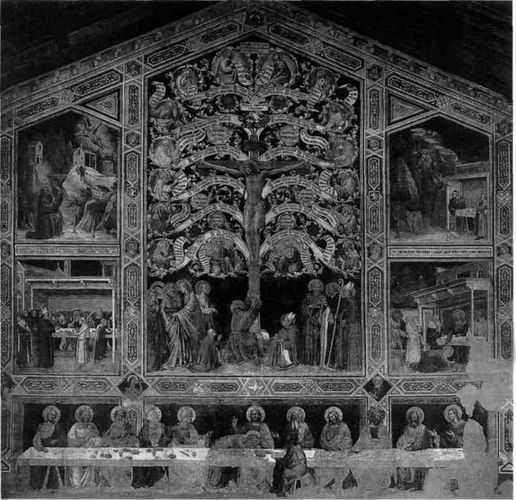 The medieval depictions of Christ nailed to a tree but not to a cross are believed to be associated with this symbolism, having been originated much earlier before Christianity, as, for instance, in the fresco by Taddeo Gaddi the Tree of Life (about 1360), the Basilica di Santa Croce (Basilica of the Holy Cross), the Baroncelli Chapel in Florence.
. As far as the most of believers were illiterate, they required clear treatments of details depicted in the icons to understand the essence of the Holy Scriptures. A certain botanic handbook has appeared as the result. For instance, the acacia symbolizes chastity of the Holy and Immaculate Virgin Mary; the almond implies the forthcoming of God; the cedar embodies the image of Christ; the chestnut stands for chastity; the elm is a symbol of generosity and commitment; the fir tree means patience; the lemon tree implies love and fidelity; the olive tree symbolizes peace; an orange blossom is associated with innocence, chastity and generosity; the cane is a symbol of humility and the Holy Passion; the willow is associated with the Holy Bible. The palm-branch often decorates images of the allegories of Victory and Glory honoring winners and is associated with victory. 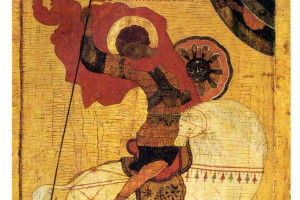 The palm tree in Christianity is associated with salvation and life in Paradise and as a rule it is depicted in the paintings of the Entry into Jerusalem. So, in the painting the Baptism of Christ ascribed to Andrea del Verrocchio and his pupil Leonardo da Vinci a palm tree is depicted on the background symbolizing salvation. 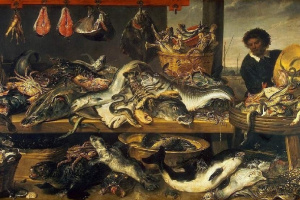 Olive is associated with the hope on peace, happy family life and deliberate work; it was usually depicted by the painters during wars and epidemics. According to the Bible a pigeon brought an olive branch after the Flood as a sign of rebirth. Neroccio di Bartolomeo de' Landi, a representative of the Sienese Italian school, depicted olive branches in his artwork the Annunciation (about 1475). Archangel Gabriel blesses the Virgin Mary; he holds nothing in his hands. A vase with the lily flower in it is on the floor and in the distance we can see olive trees embodying peace and being a symbol of the Saviour. The artists of the Sienese school very often depicted archangel Gabriel holding an olive branch in his hand. 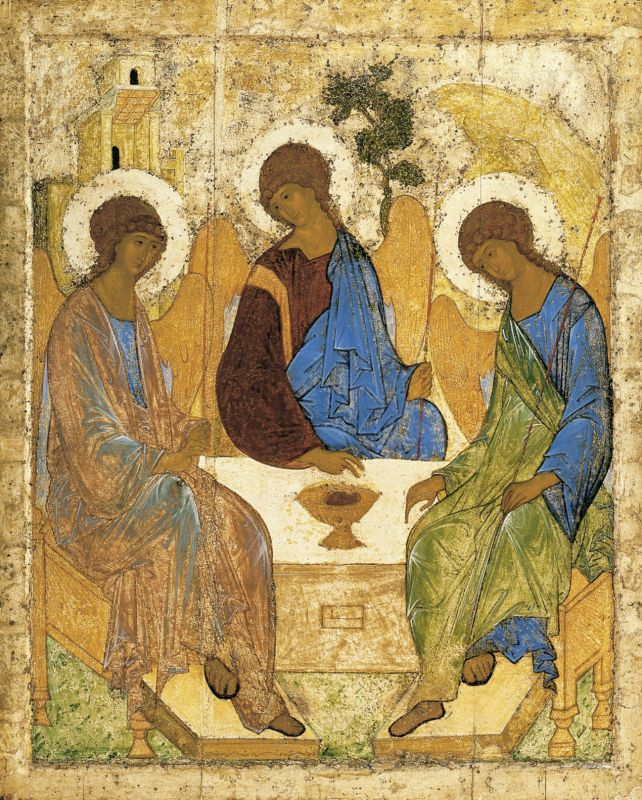 The icon painters in their Entry of Christ into Jerusalem often depicted the image of Christ holding an olive but not a palm branch in his hand. 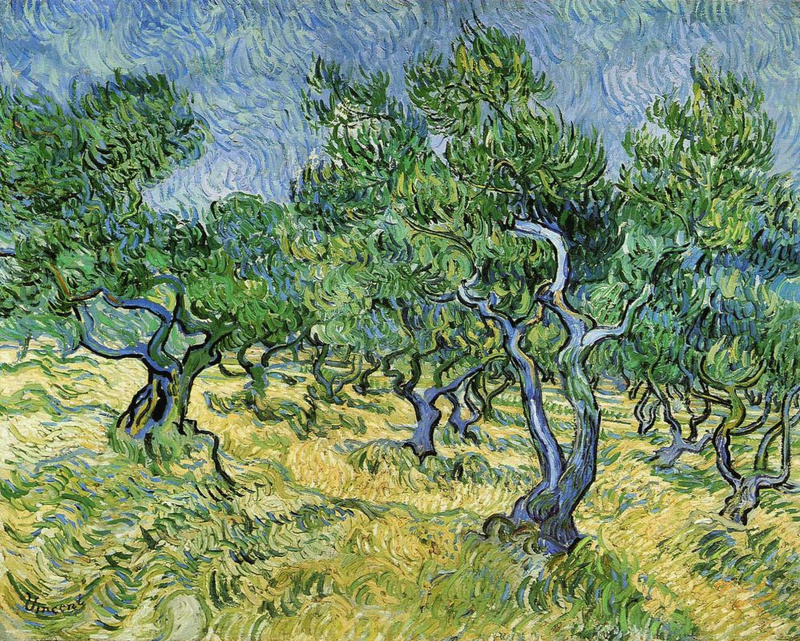 Jesus' prayer in the garden of Gethsemane and Ascension took place on the Mount of Olives, thus, an olive tree was the favorite subject for a lot of artists both now and always, including van Gogh, for example. 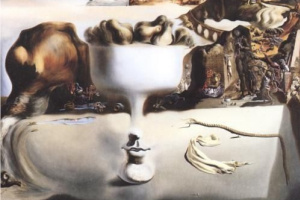 Salvador Dalí, as a true surrealist artist, had his own view on the olive tree; in his painting the Persistence of Memory the image of a dry tree embodies an old wisdom, which unfortunately has become antique nowadays. A fig tree or sycamore traditionally symbolizes lust and fertility. As history says, Romulus and Remus, legendary founders of Rome, were suckled by a she-wolf in the shadow of a fig tree, which has been considered a symbol of a prosperous Roman State. In Christianity this tree in icon painting embodied heresy; as we know, Jesus cursed a fig tree for being barren and the tree withered. In the classical art images of Adam and Eve are depicted with the leaves of the fig tree as garments for them as the legend has it. of leaves and branches of the laurel have survived nowadays with the same meaning, which is honor and glory. The myrtle is a sacred tree associated with goddess Venus, which gained its popularity during the Renaissance era, the period of efflorescence in secular art. You can see the myrtle as a symbol for love in the artwork the Sacred and Profane Love (1515) by Titian or Tiziano Vecellio (1488 — 1523). 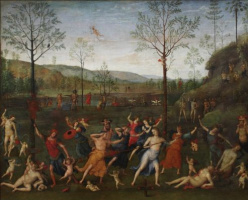 The Combat of Love and Chastity (1503 — 1505) is a painting by the Italian Renaissance artist Pietro Perugino (1452 — 1523), currently housed in the Musée du Louvre, in Paris, France. 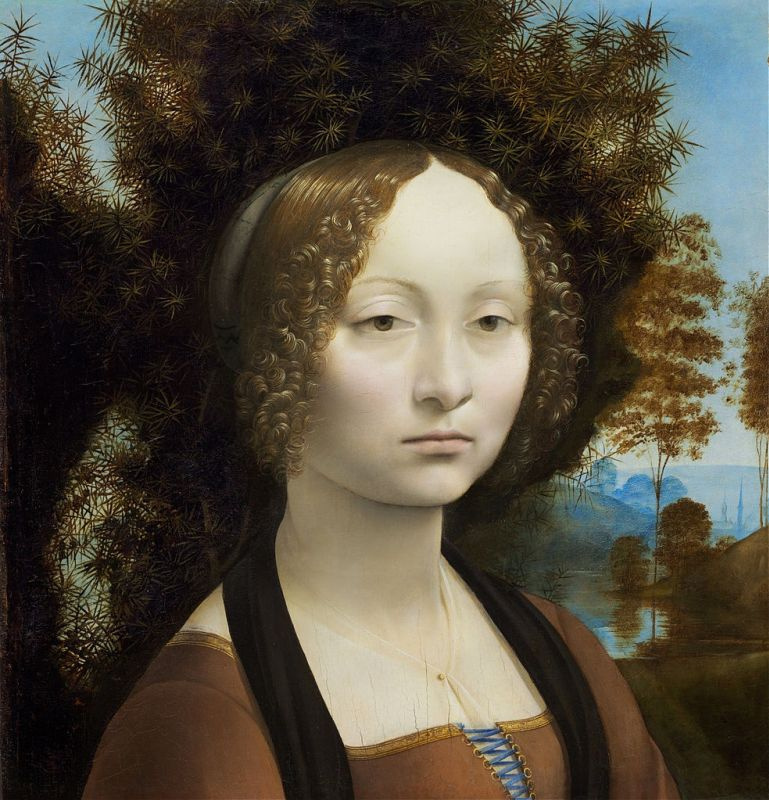 It was originally commissioned for the studiolo (cabinet) of Isabella d’Este, Marchesa of Mantua (1474 — 1539). The notary contract included all the details about the literary theme, as well as a drawing which the work had to be based on. She insisted that the myrtle tree should be painted on the background behind the image of Venus as it was her most admired plant. The juniper is a symbol for virtue and chastity. Leonardo da Vinci in his Ginevra de' Benci (1478 — 1480) being a true representative of the Renaissance art applied symbolism of plants with a stunning imagination. A face of a young lady is portrayed against a juniper bush. Juniper in Italian is ginerpo is assonant with Ginevra, which was the name of the lady posing for the portrait. The pine-tree symbolizes death; being cut it never sprout. Moreover, any plant growing next to it dies out very soon. The oak has been celebrated by all people for its power and strength including Druids honoring oaks in the sacred oak groves with songs of praise as well as ancient Greeks and Romans. Christianity added special meaning to the oak; it became a symbol for Christ. The oak could imply firmness of faith during trials. 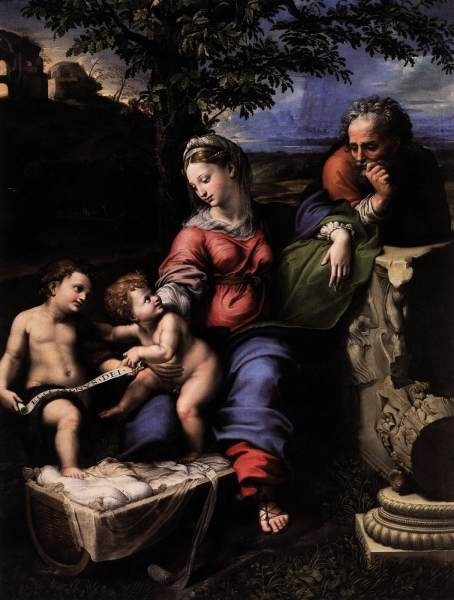 Maybe, Raphael depicting a powerful oak tree in his artwork the Holy Family under the oak (1518) kept in his mind the symbolism of the tree. The famous oak tree from the plains of Mamre, which witnessed the biblical event (the Son Appeared to Abraham in the Plain of Mamre), is depicted almost in all murals and icons with the Holy Trinity. The famous Russian painter Karl Bryullov depicted the biblical symbol in his classical artworks the Three Angels Appear to Abraham by the Oaks of Mamre (1821) and At the Mother of God Oak (1835). Fortunately, the oak tree survives nowadays in the city of Hebron in the Palestinian territories, though, it is dry. Souvenirs as if made of the holy wood, are sold in churches. 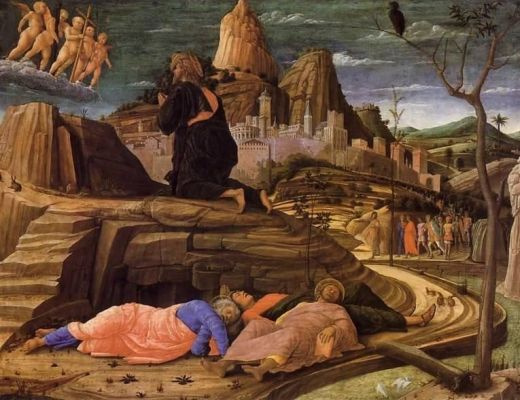 So, a dry tree with a vulture in it embodying a catastrophe, and a turned green limb promising the rebirth occurring in the near future are depicted in the Agony in the Garden by Andrea Mantegna (1431 — 1506). Three stumps point to the erected cross. A young tree behind the backs of young pupils is a symbol for a new life. 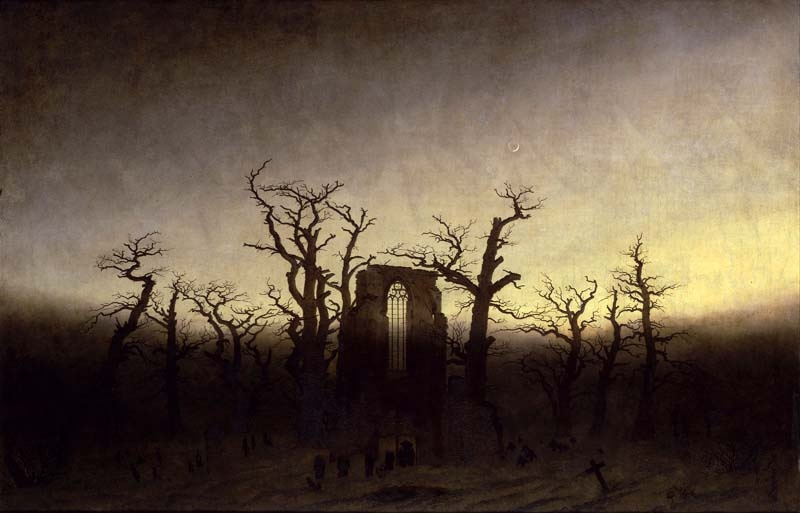 Caspar David Friedrich (1774−1840) inherited this tradition in the early XIX century. 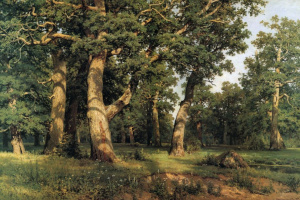 The artist admired ancient forests and enthusiastically depicted ancient trees in his paintings (The Oak Tree in the Snow, the Ancient Oak Tree with a Stork’s Nest). Dry trees with broken limbs in the artist’s oeuvre embodied fragility of a human life and following the Christian tradition they were often accompanied with young brushwood. The cross in the paintings of the young German Romantic artist was always surrounded with evergreen plants (the Cross in the Mountains and the Winter Landscape). In the XIX century the artists added dramatic quality and emotional implication to their landscapes expressing their intimate feelings. 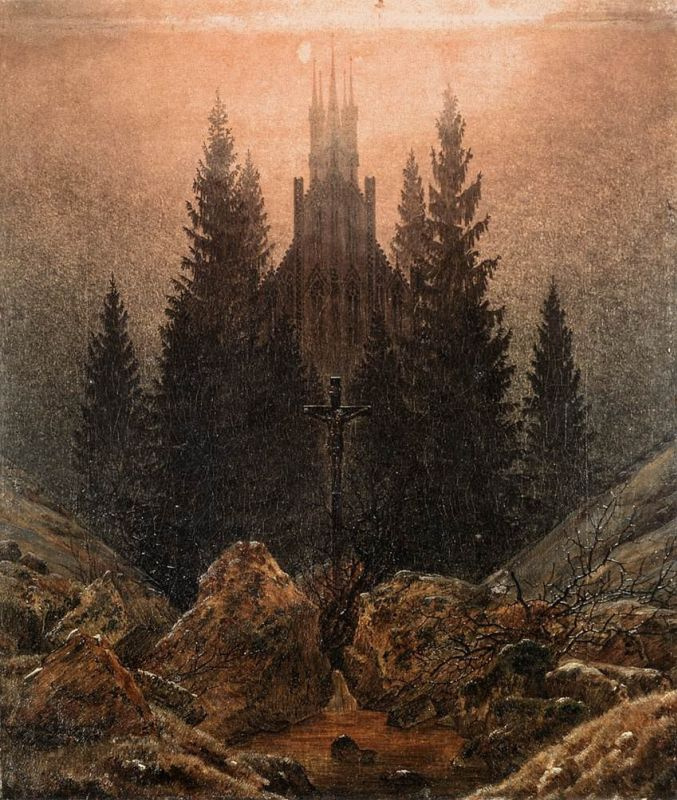 The twisted branches of trees by Caspar David Friedrich embodied rapprochement of human souls. For instance, in his Chalk Cliffs on Rügen (1818 — 1819) bent trees expressed a happy union of the artist and his wife. 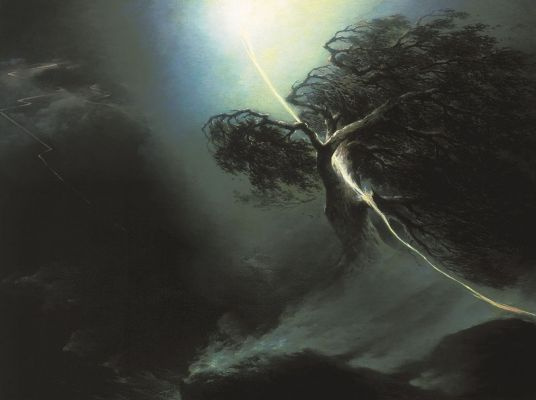 Maxim Vorobiev (1787 — 1855) produced the painting the Oak Fractured by Lightning with the fantastical image of a tree. Powerful fate coming from the dark background of the canvas targeted at the oak and split it. 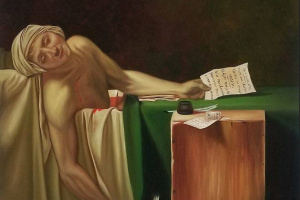 That was the way the artist depicted his pain because of his wife’s death. 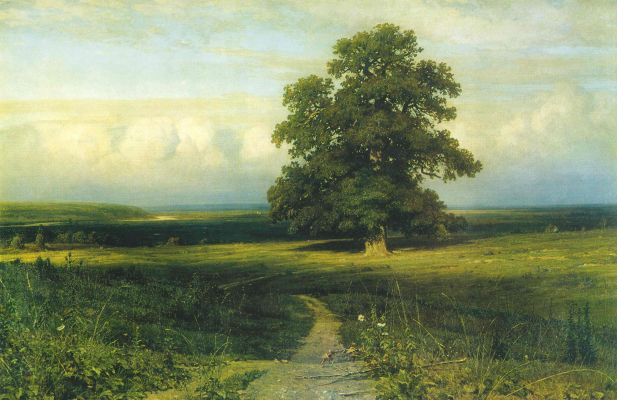 The well-known painting by Ivan Shishkin In the Middle of Flat Valley (1882) was produced by the artist a year after his beloved wife had died. He felt pain because of his wife’s death and once walking along the valley he saw an oak tree, in which he recognized himself; it was standing alone though strong and powerful regardless storms and bad weather. 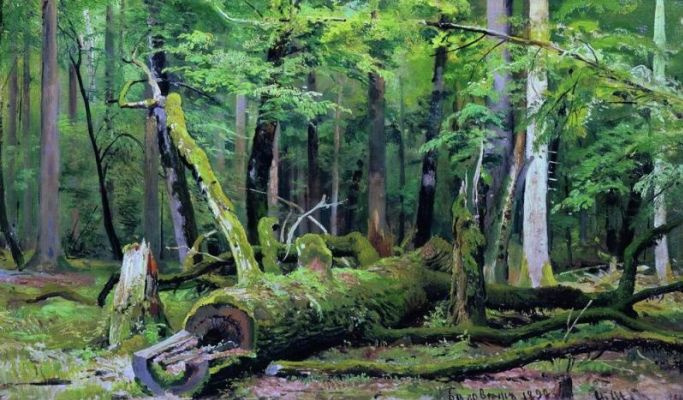 His artwork the Cut down Oak in the Bialowieza Forest (1892) causes a different sensation like a death of a living being. 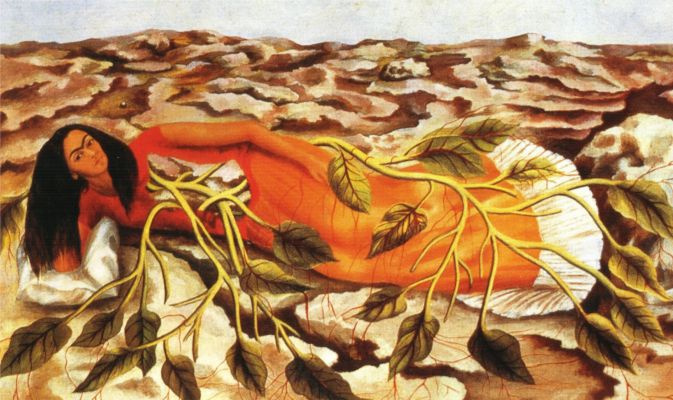 Frida Kahlo, a Mexican painter, (1907 — 1954) treats her relation to the world in her own way. 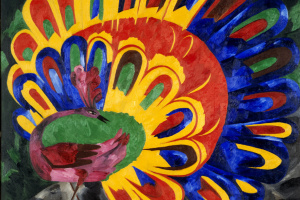 Her style is sometimes characterized as a naive art. 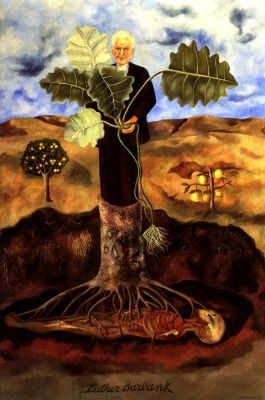 She depicted herself embraced with roots, as an integral part of the Nature, which would absorb her. A successor of the folk traditions she had an innovative seeing of relations between plants and a human being. For example, the Portrait of Luther Burbankr (1931), a horticulturist, and The Roots are taken literally in no uncertain terms. 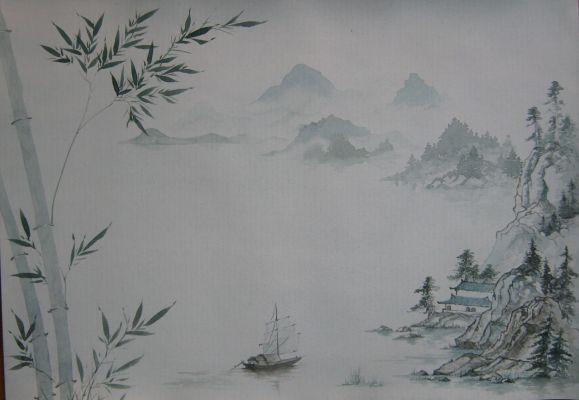 A little bit different aesthetic cult of a tree exists in the Chinese painting. The most popular plant in the Chinese art is a willow as a symbol for beauty and nicety, spring and embodiment of Guanyin, the goddess of maternity. A pine tree is also a favorite subject of Chinese artists as it is associated with a Confucian austerity and firmness as well as with the Daoist concept of "use and useless" (twisted and knotty wood is useless for artworks). 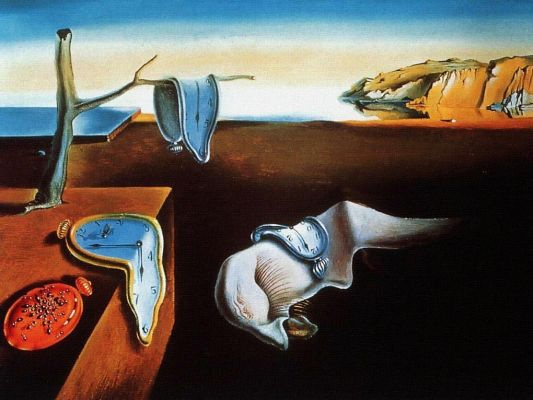 of trees and being aware of the hidden sense of the image you can have a new particular seeing of the famous artworks. Елена, большое Вам спасибо. Очень понравилась статья. БЛАГОДАРЮ.